Reporting in the journal Nature, a team of scientists from Yale University in the U.S and the University of Erlangen-Nuremberg, in Germany, have linked junk food diets to be partly blamed for autoimmune diseases such as multiple sclerosis, including alopecia, asthma and eczema. The modern diet of processed foods, takeaways and microwave meals presets a sharp increase in autoimmune diseases and families who eat them have much more difficulty. Since autoimmune diseases cannot be blamed directly on genetic factors, researchers indicate that the sharp increase in these diseases is linked to dietary habits in developed countries, where highly processed food and fast food are often on the daily menu. The findings suggest that salt in processed foods may play a previously unknown role in triggering autoimmune diseases. 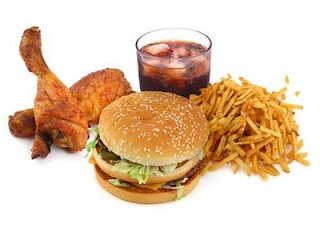 Junk foods at fast food restaurants as well as processed foods at grocery retailers represent the largest sources of sodium intake from refined salts. The team from Yale University studied the role of T helper cells in the body. These activate and 'help' other cells to fight dangerous pathogens such as bacteria or viruses and battle infections. However, salt makes them act more 'aggressively.' Mice fed a diet high in refined salts saw a dramatic increase in the number of Th17 cells in their nervous systems that promoted inflammation. Laboratory tests revealed that salt exposure increased the levels of cytokines released by Th17 cells 10 times more than usual. Cytokines are proteins used to pass messages between cells. It strips the myelin in the nerves fibres, which disrupts messages passed between the brain. Immune system mistakes these effected myelin that surrounds the nerve fibres in the brain and spinal cord for a foreign body and the autoimmune starts. - One packet of KFC’s Marzetti Light Italian Dressing might only have 15 calories and 0.5 grams fat, but it also has 510 mg sodium--about 1.5 times as much as one Original Recipe chicken drumstick. - Just one 6-inch Roasted Garlic loaf from Subway--just the bread, no meat, no cheeses, no nothing--has 1,260 mg sodium, about as much as 14 strips of bacon. Salt is critical to our health, however, refined, processed and bleached salts are the problem. Himalayan rock salt or Celtic salt are salts filled with dozens of minerals and our body benefit tremendously for their incorporation into our diet.